RAPID CITY, SD, MAY 5, 2016 - B9Creations has developed a 3D printing solution for dentistry to increase production while improving quality and precision. The accuracy of digital precision can now be achieved throughout the production stage thanks to 3D printing technology. 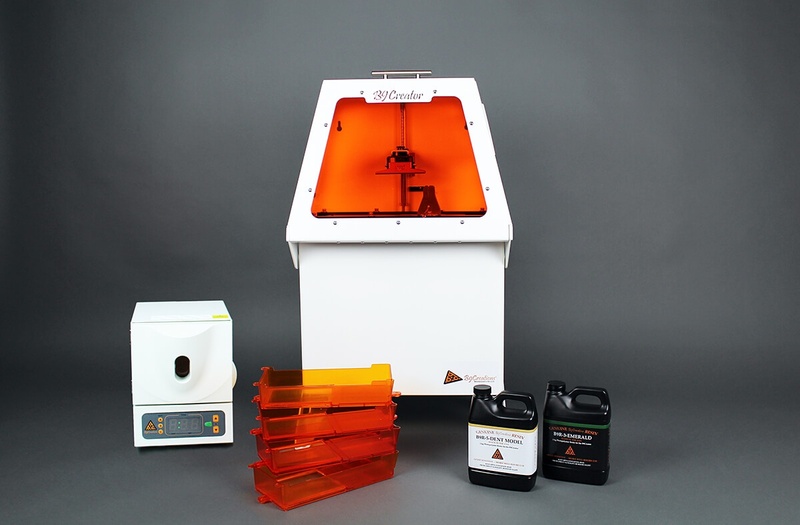 Implementing the B9Creations Dental Line allows dentists and dental labs to eliminate manual modeling while increasing capacity, creating faster turnaround, and enhancing workflow. This exclusive dental package includes the B9Creator v1.2 Dental, the B9 Denta Cure, and the Model Dent Resin creating a seamless workflow that delivers consistent manufacturing quality. The B9Creator v1.2 Dental includes modified software suited to accommodate dentistry needs making it easy-to-use and continuing to speed-up the production process. The B9 Denta Cure is a professional-grade post-curing unit delivering fast, consistent, and precise results to all dental models. The B9R-5-Model Dent Resin prints with the precision and quality needed in professional dentistry. To view more features and specifications on the B9Creations Dental Line, view the attached .pdf file. For more information on B9Creations 3D printing solutions, visit www.b9c.com, email us at info@b9c.com, or call 605-787-0652.